And I Thought I Loved You Then: Sunshine Award!! My blog just received its first award! What a great way to feel special. Many thanks to Beauty and the Green for choosing me as a recipient of the award. You really made my day! 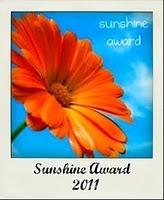 The Sunshine Blog Award is awarded to bloggers whose positivity and creativity inspire others in the blogosphere. I am so happy that I am considered a part of this community. I created this blog as a way to remember these times in our life and it has grown so much bigger then I ever expected. 3. And pass the award to 10~12 fabulous bloggers, link their blogs and let them know you awarded them. Favorite color? Pink, Purple, White, and Gray are my go to colors. Favorite animal? I have always loved elephants, I am not sure why, but they are so beautiful to me. Favorite drink? Caffeine free Diet Pepsi, I was a huge Diet Pepsi drinker before I was pregnant, I switched to CF when I found out Eliza was growing. Facebook or Twitter? Facebook for sure. Favorite flowers? I love hydrangeas(sorry Madonna), they were my wedding flower and I planted hydrangea bushes in our gardens so I can see them each year. And there you have it, now, it's time for me to share the love. The blogs that I am listing below keep me smiling, inspired, entertained, informed and looking forward to their next post! Check them out and you'll see why. Today I am so thankful that there are people out there who enjoy what I do! I found you on the Sunday Drive and really like your blog! I'd love a follow back! Congratulations on your award. Spreading inspiration is a wonderful thing.